It should have been the perfect afternoon. The sun was shining on an unseasonably warm October Saturday in New York City. Leaves were starting to color and fall. The flats and hills of Van Cortlandt Park in the Bronx were ribboned with the motley uniforms of a thousand high school cross country teams competing in one of the largest meets in the nation. In its 36th year, the venerable Manhattan College High School Invitational was lurching through another exciting, chaotic, exuberant day of racing. The boys and girls Eastern States Championship races were looming and loaded with talent. The best of the meet was yet to come. And then, just after 2 pm, a runner from Sherwood High School in Sandy Spring, Maryland, powered out of the woods with a wide lead in the Varsity Boys E Race and streamed across the finish with an eye-popping time. The tall, lanky runner froze the clock at 12:06.7, slicing nearly 4 seconds from the 2006 course standard of 12:10.6 by Fayetteville Manlius NY star Tommy Gruenewald. With 40 races on the slate, and at least two races on the course at any given time, the accomplishment failed to register immediately with the harried finish line contingent. There was no loud speaker countdown as the athlete labored home on the long final stretch, no historic announcement of his name as he snapped the tape with the fastest time ever run on the 2.5 mile layout. But moments later, the crowd was buzzing. “Hey, that dude just broke the course record!” a meet volunteer shouted, as the runner slipped languidly along the narrow chute, sweat-soaked jersey clinging to his chest. The name was certainly familiar to followers of high school running. Haile (left, John Nepolitan photo) had emerged on the national racing scene the previous winter, a recent immigrant from Ethiopia who enrolled as a junior in Maryland's Sherwood High School in time to win the Nike Indoor National 5000 meter race in a meet record time of 14:53.93 on March 15, 2008. That spring, Haile set the Maryland 3200 state record, won the Nike Outdoor National 5k (14:38.23, tying the meet record), and returned the next day to win the unseeded section of the NON Boys 2 Mile in 9:08. With less than a year in the country, he was a double national titlist and tagged as one of the top returners in the Class of 2009. The victory at Manhattan should have been a coronation of sorts, a race minting Haile as a major contender for post-season laurels in his first cross country season as a US high schooler. It should have been the perfect afternoon, but a cloud of questions that have been swirling around Haile since at least that March 2008 Nike Indoor coming out party emerged to darken the sun-splashed day. Word of Haile's impressive accomplishment spread rapidly among the websites and message boards which serve the high school running community. On some levels, in certain circles, his achievement in New York surpassed even those national titles and state records. This wasn’t a sleepy Saturday morning indoor 5k or its Thursday night outdoor equivalent—competitive races at the Nike Nationals, but thinly contested compared to the elite distance events held later on those weekends. This was Van Cortlandt, the time-honored New York cross country course traversed by some of the best runners to ever stamp out a high school race. Brad Hudson…John Trautmann…Alan Webb…Alberto Salazar…Marty Liquori…all of those names were now behind Haile on the all-time list, along with Gruenewald, Craig Forys and Steve Murdock, a trio who took advantage of near-perfect conditions in 2006 to claim the top three spots on the list prior to Haile’s effort. New Yorkers and other East Coast running aficionados, legendarily defensive of their "Vanny" course and the times recorded there, were understandably suspect of this recent arrival from Addis Ababa, Ethiopia. It would be easy to ascribe this suspicion to a xenophobic distrust of a foreigner of an uncertain age taking down marks run by “American kids,” and certainly there were elements of jingoism in the discussion which arose in the days after Haile’s record run, but the balance of the skepticism appears to be grounded in something even more fundamental than national identity—an expectation of basic fairness and honesty. On an afternoon that should have been devoted to celebrating a sublime accomplishment, the discussion quickly turned to deeper issues. Those same internet sites which conveyed word of Haile’s blistering time soon lit up with old rumors and archived links calling into question the age and eligibility of the young harrier. There are two concerns which have dogged Solomon Haile at least as long as he has been on the national radar as a US high school runner. The first is the question of his age; the second is the matter of his status as an amateur athlete. The two are inevitably intertwined, with equal implications for his eligibility, but they bear separate consideration. It goes without saying that when young people arrive legally from another country to live and attend school in the United States—as Solomon Haile did—the level and forms of documentation regarding proof of age will vary greatly depending upon the record-keeping practices of the country of origin. The International Student Admissions Office for the state of Maryland offers guidelines for the admission of “students between the ages of 5 and 21 living with a parent/guardian who is a bona fide resident of Montgomery County.” The requirements include age verification ranging from a birth certificate to a passport to a family Bible or church certificate. In most circumstances, decisions about this documentation pass privately without comment, and eligible students are quietly enrolled without broad public interest. Typically only when students are athletes—and then only when they exhibit exceptional talent—does the age verification draw closer scrutiny. In Haile’s case, while he would have been admitted to the Maryland public schools as a 21 year-old, given the guidelines above, in order to compete in high school athletics he had to meet the stricter standard of the Maryland Public Secondary Schools Athletic Association (MPSSAA) handbook, which says students must be under the age of 19 on August 31st in order to compete in that year’s contests. 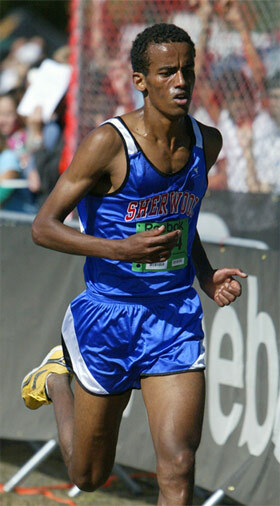 Solomon Haile; his school’s athletic director, Jim Meehan; and his coach, Dan Reeks, all claim he has met the requirements and produced the appropriate documentation, having been placed at Sherwood (based on the school’s strong ESOL program) as an 18 year-old with a birth date of January 23, 1990. Montgomery County school officials and the Executive Director of the MPSSAA echo those assertions. Edward “Ned” Sparks, Executive Director of the state-wide MPSSAA, reiterated the county findings in a separate phone call. By these accounts, Haile should be eligible to compete through his senior year, turning 19 in January 2009—older than some, perhaps, but legally able to race. Clouding the issue of his age substantially, however, is the fact that in the months prior to enrolling at Sherwood, Haile competed in multiple road races in the United States and internationally as a 20 year-old named Solomon Semungese. 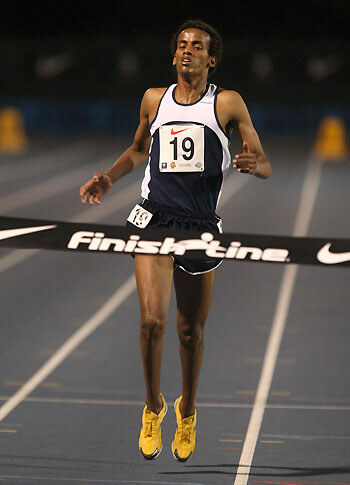 As recently as December of 2007, three months prior to winning his first national title as a prep runner, Haile was winning road races as a twenty year-old. If he does in fact have a January 23rd birthday, internet postings suggest, he is either competing now as a 21 year-old high schooler—soon to be 22—or he dissembled about his age on multiple race entry forms in the US, and several other nations, over the course of the previous year. Haile has never denied using a different name on his road racing forays. Last winter, just as he was starting to represent Sherwood High, he told a reporter for the school newspaper, “In Ethiopia it is tradition to use your father’s first name after your name, so I call myself Solomon Semungese. Semungese is my father’s name." 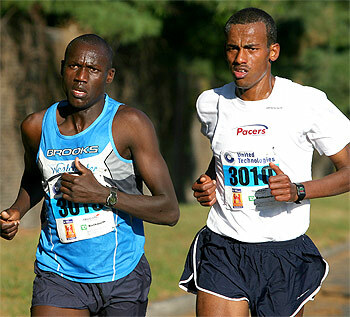 Haile (#3010) competes in the 2007 Hartford Half Marathon, where he placed second. Inset (above), close up showing his entered age as 20. When he began running at the high school level, he dropped his father’s name for his own surname, Haile. Nonetheless, the name “Solomon Semungese” or its reversed variation, Semungese Solomon, appears in multiple road race results from 2007, in locales as varied as Italy, Austria and Thailand, almost always with the given age as 20. On this point, Haile has been less consistent with his reasoning. But by the time of the Nike Indoor National meet, he was telling reporters he’d been dishonest about his age on race entry forms to avoid having a parent or guardian present to sign the waivers. Haile’s father is still in Ethiopia, his mother is deceased, and he is said to live in the US with his sister, Naomi. MPSSAA Executive Director Sparks also offered the parent/guardian explanation for the age discrepancy. However, in at least two of the races Haile entered and placed as a 20 year-old—the Hartford Half Marathon in Connecticut and the Jingle All the Way 10k in Washington D.C.— the race waiver clearly states that parents or guardians for persons under the age of 18 must be present to sign the waiver. The question inevitably arises: if the waiver requires only that someone be 18 years-old to avoid a parental signature, why claim an age of 20? And why do so time and again, domestically and internationally, right up to the point of entering a high school program which requires students be under 19 to compete? Neither Haile nor any of the state officials has been able to provide a satisfactory response to this question. The other concern which energizes running message boards and has yet to be addressed on an official level is the issue of Haile’s amateur status after receiving prize money for road race accomplishments prior to enrolling at Sherwood. In at least one case, and there are likely more, given the breadth of Haile’s competitive career prior to enrolling at Sherwood, Haile (competing as Solomon Semungese) received financial gain for his high finish in a road race. Beth Schluger, race director of the Hartford Marathon and Half Marathon in Hartford, Connecticut, confirmed this week that after taking second place in the Hartford Half Marathon on October 13, 2007, Haile received a check for $350, in care of his sister Naomi Haile. The purse for second place would have been $500, Schluger said, but $150 was withheld for non-citizen taxes. Dr. Beattie of the Montgomery County public schools, for one, was surprised by this revelation. Up to this point, it appears, no one has come forward with a formal complaint regarding amateur status, or evidence to back it up. If Haile was planning all along to enroll in a US high school and pursue a prep career before seeking collegiate opportunities, he certainly didn’t indicate that when he spoke with the Washington Post in late 2007, after setting a course record in the Jingle All the Way 10k. On December 10, 2007, the Post reported that, “Semunguse, 20, has been living with his sister, Naomi, in McLean the past two months, during which time he has raced repeatedly with the hope of earning a few dollars and more importantly, attracting a manager. Yesterday's race offered no prize money, and Semunguse was further disappointed not to receive a waiver of his entry fee. There is much to like about Haile, too. He is polite and earnest in conversation, soft-spoken and deferential to his competition. He has a captivating warmth to his deep-set eyes, an engaging smile and an easy-going manner. He is eager to do well, works hard and has an enviable effortlessness when it comes to running. The claims being leveled against him, however, are no small matter. They have real-world consequences for a young man with heady aspirations, and they threaten to derail a senior year full of promise. Because post-season events like the Nike National series and the Foot Locker National Championship use the same basic standards as the National Federation of High School Associations (NFHS) for determining age eligibility, and the Federation in turn relies on the diligence of the member associations, everything hinges on the assessment of the state of Maryland. And for the moment, Maryland has determined that Solomon Haile is eligible. On this point, at least, MPSSAA Executive Director Sparks is emphatic. It remains to be seen—for fans of high school running as well as hundreds of schoolboys due to compete against Haile in the coming months—if that will be enough.